I love the challenge of a nonfiction picture book. There’s no single best way to present a topic–whether it’s community helpers, the many roles water plays in our world, or the life of an individual. 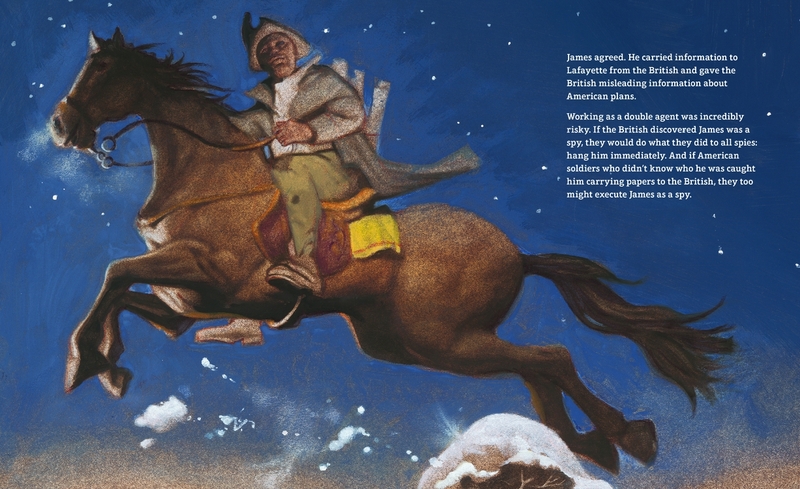 When it comes to picture book biographies, I look for stories we don’t already know. Examples of this include One Plastic Bag: Isatou Ceesay and the Recycling Women of the Gambia by Miranda Paul, illustrated by Elizabeth Zunon; The Nutcracker Comes to America: How Three Ballet-Loving Brothers Created a Holiday Tradition by Chris Barton, illustrated by Cathy Gendron; and the forthcoming A Spy Called James: The True Story of James Lafayette, Revolutionary War Double Agent by Anne Rockwell, illustrated by Floyd Cooper. A Spy Called James comes out on November 1, and it posed some interesting research challenges for Anne Rockwell. In brief, there is not a lot of information out there about James Lafayette. We know that he was born into slavery in Virginia in about 1748 and he was owned by William Armistead. During the American Revolution, James played a significant role as a double agent, providing the Americans key information that led to a defeat of the British at the Battle of Yorktown. After the war, despite his important contributions, James was still enslaved. While the state of Virginia emancipated salves who had enlisted in place of their owners, James had been a spy–not a soldier–so the law did not apply to him. Thus began James’s quest to procure his own freedom. We know about his contributions during the war and his petitions to the Virginia General Assembly for freedom because documentation exists. And so we know that it was not until the Marquis de Lafayette wrote a letter in support of James that he was finally freed on January 9, 1787. As tribute for what Lafayette did, James took the last name Lafayette. As far as we know, James Lafayette did not ever write about his own life. Documents show that he married and had at least one son. He also purchased land and owned between one and four slaves at different times. Yes, a former slave owned slaves. Why did he do this? James never said. But this article by Henry Lewis Gates Jr. offers some possible explanations. So what is an author to do when she doesn’t have as much information as would be ideal? One option is to simply move on to another, better documented topic. But the problem is that very often the lives of marginalized people are not as well documented as those of white, wealthy people. When Vaunda Micheaux Nelson couldn’t find all the information she needed to write a nonfiction book about her great uncle, Lewis Michaux, she instead wrote No Crystal Stair: A Documentary Novel of the Life and Work of Lewis Michaux, Harlem Bookseller. In this case, Anne Rockwell shaped a story around the parts of James’s life that we know the most about. And Floyd Cooper created gorgeous artwork to breathe life into that story. I will never know everything I want to know about James Lafayette. But what I do know has helped to give me a broader perspective on the lives of enslaved men during and after the Revolutionary War. While James’s life is not without complications, I hope that young readers can also find inspiration in his quest for freedom. Pleased to Present, Our New (and Free) Lerner Digital eReader App for Chromebook!